Ireland has a long history of “informal” adoptions prior to the passing of the 1952 Adoption Bill. These continued even after the passing of the legislation and were therefore technically illegal adoptions (e.g. birth certificates being forged to list the adoptive parents as the natural parents). In these latter cases, and in cases prior to 1952, there is no “Non-identifying Information” available for adoptees and DNA may be their only recourse to help identify their birth families. For those adopted post-1952, “Non-identifying Information” is available only through an intermediary such as a social worker from the Adoption Agency that arranged the adoption (if it still exists). The Adopted Children’s Certificate (available from 1954) is issued in place of a birth certificate and contains a date of birth for the adoptee that is usually within 6 weeks of the actual date of birth. This can be useful for trying to identify a potential birth mother in the Civil Birth Register at the General Registry Office in Dublin (see the video above for further information). Currently (March 2018), a new law entitled the Adoption Bill (Information & Tracing) 2016 is currently under review. This proposes to change the law in relation to adoption and the ISOGG Ireland group have written a Commentary on the new proposals which you can read about here. How do I identify my birth parents (or my adopted child)? How do I approach contacting them (or their families)? How do I protect people from getting hurt (including me)? It is important to think these questions through in advance because DNA could potentially reunite you with your birth family very quickly indeed. What will you say to them when you find them? How will you introduce yourself? Often such a discovery can result in very strong and mixed emotions, and it can be very helpful to have your letters of introduction written before undertaking DNA testing. And having a support network of family, friends, and Search Angels ready to encourage and guide you will help maximise the chances of a positive outcome to your research, which is what everyone wants. This is particularly important in Ireland where the topic of adoption can be a very sensitive matter for many people, and public opinion is split on the right of the adoptee to know who they are and where they came from versus the right of the mother to privacy. Sensitivity, diplomacy, and mutual respect will go a long way toward a positive outcome for all parties concerned. If you are a birth parent who gave up your child for adoption, it is possible that they have started to search for you and may have taken a DNA test as part of that process. Therefore it is worthwhile taking an autosomal DNA test with all three major DNA testing companies in the hope that you will find your child there (or indeed even one of their own children). If they are not there, your DNA will serve as a legacy so that if, at any point in the future, they or one of their descendants come looking for you, they will find you. This only works if you are man. It will not work if you are a woman. This is because it relies on Y-DNA testing, and Y-DNA is only passed from father to son. It is never passed from father to daughter. If you are lucky, one surname among your matches will stand out, because it occurs most frequently. Alternatively, two or three surnames will occur with the same frequency, but at least it helps you narrow down the options, and a certain name may tie in with what you know from your documentary research or your non-identifying information. If you are unlucky, your Y-DNA may be relatively rare and you may have few or no matches at all. The overall success rate with this technique is somewhere in the order of 10% to 40%. The bottom-line is you won't know it's going to work until you try it. The company to test with is FamilyTreeDNA. It is probably best to test out to at least 67 markers (the Y-DNA-67 test), but you can start out with the 37 marker test (Y-DNA-37, $149) and upgrade it a later point in time if need be. This technique also works for fathers and grandfathers who were adopted, as long as the test-taker is a man on the same direct male line as the father or grandfather. If you are an adoptee (or one of your parents or grandparents is), you should put your autosomal DNA (atDNA) in all the major DNA databases currently available, in the hope that you will find your birth parents or one of their close relatives there. There is one other major company you could consider testing with (23andMe, 99 euro) but only if you don't get close matches in the other databases. At a later stage, if you need to do confirmatory DNA testing, simply use whichever of the above tests is the cheapest at the time (the various companies have frequent sales where the price can drop to as low as $49). 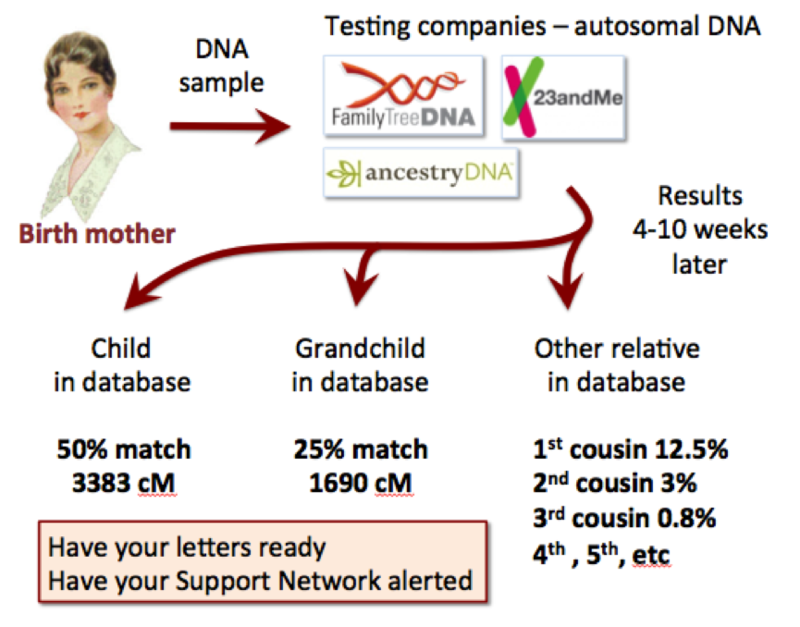 If you are very lucky, your atDNA results will include a very close match and you will be reconnected with your birth family in a matter of days or weeks. My good friend Winnie had been searching for her family for 40 years. At 76 years old, she felt she was running out of time. But six weeks after doing her DNA test, she found the son of her half-sister in the database. Days later she was reconnected with four half-siblings she never knew existed. And they welcomed her into the family with open arms and warm hearts. What an incredibly precious gift. You can see Winnie’s story on YouTube. Most people don’t have such very close matches, although clearly it is possible. It’s more likely that your closest match will be a third cousin, or if you’re fortunate, a second cousin. Both of these scenarios are good news. What then follows is a sequence of steps to figuring out who is your common ancestor (or rather your common ancestral couple – because most of the time you will share an ancestral husband and wife in common). Oftentimes, these steps are done in parallel rather than in sequence. 1. Starting with your closest match(es), get hold of their family tree. Sometimes this is already available because they have shared it publicly online, but sometimes you have to ask them for it nicely. And that means engaging them in a conversation initially and developing a trusting relationship with them over time (and by “over time” I usually mean weeks if not months). If they are a predicted second cousin, for example, then your predicted connection is somewhere at the level of their great grandparents, of which there are 4 pairs. One of these pairs will be your great grandparents too … but which pair? 2. Find other people who match you both. The chances are that these “Shared Matches” or “In Common With” matches are also descended from the same common ancestral couple (but beware of double-cousin connections – they can throw a spanner in the works). Get hold of their family trees and figure out how they are connected to your closest match. This exercise will hopefully identify a single common ancestral couple. If you are lucky, your closest match will also have other family members who have tested and who match you, and this will narrow down the connection to a single ancestral couple in their family tree. 3. Use the data from the Shared cM Project to help you create a draft family tree of how you are connected to the matches above. Be aware that this is merely a “most likely scenario” and the connection may be a generation higher than you have predicted (or even two). Keep it “Private” for now (i.e. not publicly visible) because it is largely experimental. This process involves building "mirror trees" i.e. you copy across potential relatives and ancestors from the trees of your closest matches. There are lots of tutorials online on how to do this (google them). 4. Having identified the “most likely” common ancestral couple, trace all their descendants down to the present day. If your estimations are correct, one of these descendants will be your biological father or your biological mother … but which one? e. Actively search for your “other grandparent”. Up until now, you have identified every descendant of a specific ancestral couple. And this process may have resulted in you identifying, say, three candidates for, say, your biological father. All three candidates will have one parent that belongs to the same family tree (i.e. all descended from the specific common ancestral couple you have previously identified). But they will also have “another parent” that has “married in” to the family in question. And each of those three “other parents” will have a completely different family tree attached to them. 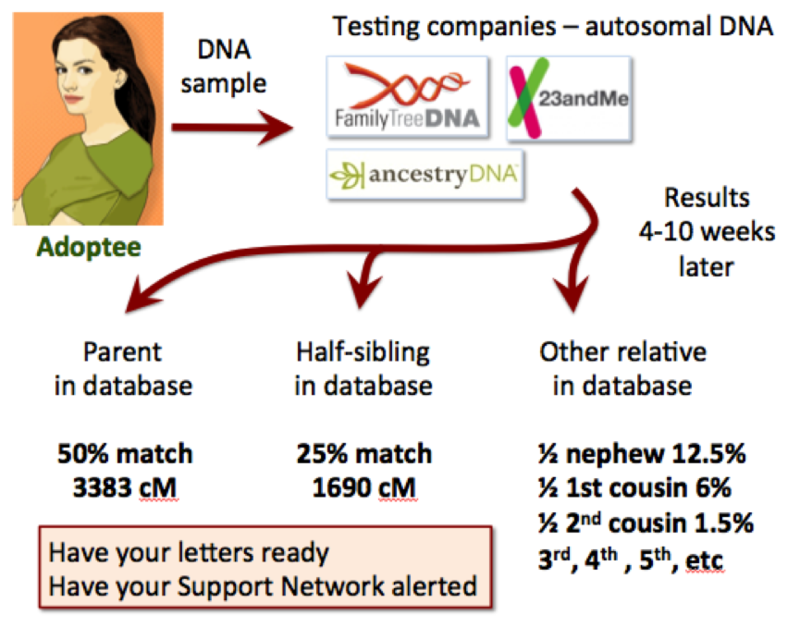 The trick is: can you find evidence among your other atDNA matches as to which of these three “other families” you are genetically connected to? And that means building these spouse’s trees back as well, back into the 1700s preferably. There is an extra trick if you have tested with Ancestry - you can “attach” yourself as a child to each “candidate parent” in turn. Once you hit the right one, you should see many more “DNA leafy hints” appear (on both grandparental lines) indicating that you may have found the correct “candidate parent”. It may take 24 hours for new DNA leafy hints to appear so best to attach yourself to only one “candidate” per day. 6. Armed with a theory, supported by the evidence, you approach your theoretical cousins and ask them to do a DNA test. Start with the more distant cousins and gradually work your way in towards your half-siblings. If they test positive, and support your theory, then you go for the next closest cousin and get them to test. This takes months. Finally, you bite the bullet, and approach your theoretical half-siblings and ask them to test. You can imagine how delicate this last step can be. You may benefit greatly from using an intermediary, particularly someone with professional training in reconnecting adoptees with their birth families. You usually only get one shot at this. Hence the recommendation to test the more distant cousins first – it helps you fine-tune your diplomacy, negotiation and persuading skills. 7. Take time to enjoy your new family. Make time to get to know them. Develop a concrete plan for a long term relationship with them. Don’t let it slide. This takes work. 8. Once you have identified one biological parent, you can start on the search for the other. I would often recommend waiting for at least one year before undertaking this second journey. FamilyTreeDNA have a wonderful “buckets” feature that allows you to divide your matches into Paternal and Maternal. This is helpful for eliminating those matches that are not on the side of the family of interest, thus helping you focus your attention on matches that are more likely to be connected to you via your other parent, the focus of your second journey. That in a nutshell is the process I use. Others will have slightly different approaches or may have other hints and tips that may speed up the process. There are a few things I have learnt through this work: the family trees on Ancestry are indispensible; so too is the ability to build trees from scratch using the records on Ancestry; first cousins are more reticent to get involved (they are too close to the supposed half-siblings in question) so it may be necessary for the adoptee to go directly to their half-siblings and “come clean”; expect surprises – they happen often, and can be emotionally overwhelming; the circumstances of the conception can be different to that expected; all adoptions are traumatic – it is never easy for a parent to give up her child; sometimes the family concerned refuses contact; sometimes the family concerned can be more helpful and more welcoming than expected. All in all, this work is often very gratifying for all concerned and a wonderful application of genetic genealogy. 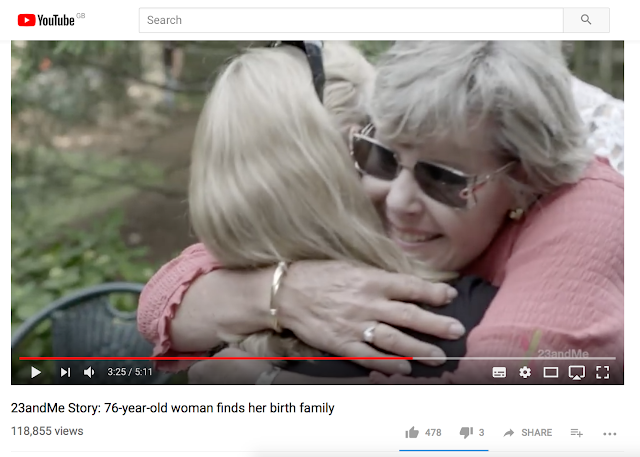 Adoption Stories – a TV series produced by Sharon Lawless, which tells the stories of people touched by adoption in Ireland, whether they are adoptees, birth parents, or adoptive parents. The tone of these excellent programmes is refreshingly balanced and factual.